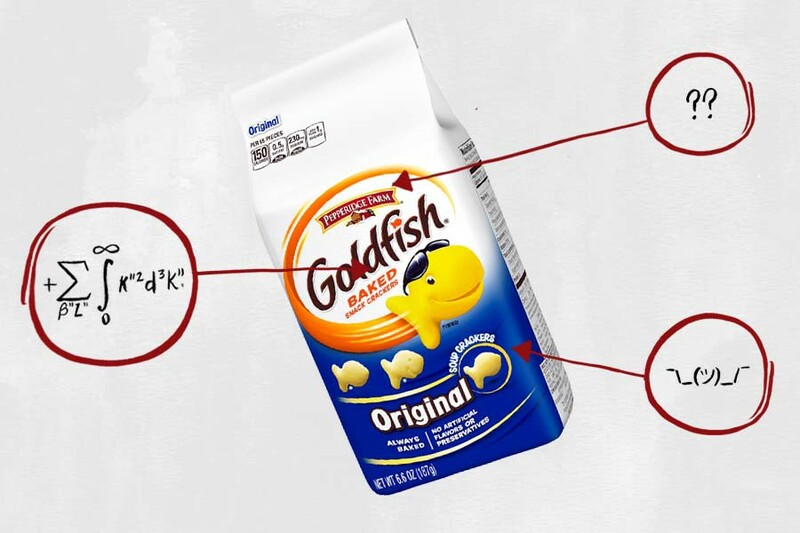 This edition: Goldfish Original, which are made from 13 separate ingredients that we’ve broken down in the exact order they appear on their website. 1) Smiles: “Smiles” are actually on this ingredients list, and I’m not even mad about it. 2) Enriched Wheat Flour (Flour, Niacin, Reduced Iron, Thiamine Mononitrate, Riboflavin, Folic Acid): As we learned in our exploration of the many, many, many ingredients in the McDonald’s Big Mac, enriched flour isn’t actually “enriched” at all. In addition to containing more calories than whole wheat flour, the bleaching process enriched flour often undergoes produces an unfortunate byproduct: A chemical called alloxan, which has been found to induce diabetes in lab-animal test subjects by destroying their pancreas. 3) Canola and/or Sunflower Oil: Physician and biochemist Cate Shanahan, author of Deep Nutrition: Why Your Genes Need Traditional Food, previously told us that consuming too much vegetable oil (sunflower, canola or corn) — which is easy to do, considering she says roughly 45 percent of the average American’s calories come from refined oils — has serious repercussions (i.e., fatty liver disease, insulin resistance and migraines). While it’s nearly impossible to eliminate vegetable oil from your diet altogether — major contributors include processed foods, fried foods, frozen pizzas, cakes, cookies, margarines and coffee creamers — it’s best consumed in moderation. 5) Yeast: The fungus that causes dough to rise. 6) Nonfat Milk: This probably provides a creamier flavor and texture. 8) Baking Soda: Baking soda is often used as a leavening agent, causing dough to rise and become porous by increasing the surface area. 9) Monocalcium Phosphate: In baked goods, monocalcium phosphate reacts with baking soda to produce carbon dioxide, which helps the dough rise. When consumed in moderation, this ingredient isn’t anything to worry about. That said, an excessive amount of phosphates in the diet, particularly when contained in processed foods like Goldfish, can accelerate the aging process, increase the risk of heart disease and place undue stress on the kidneys. 10) Paprika: This gives Goldfish their orange color. 12) Celery: For more flavor. 13) Onion Powder: This is an easy one — dehydrated, ground onion used for flavoring. So go ahead, eat those Goldfish without regrets. You deserve the smiles.